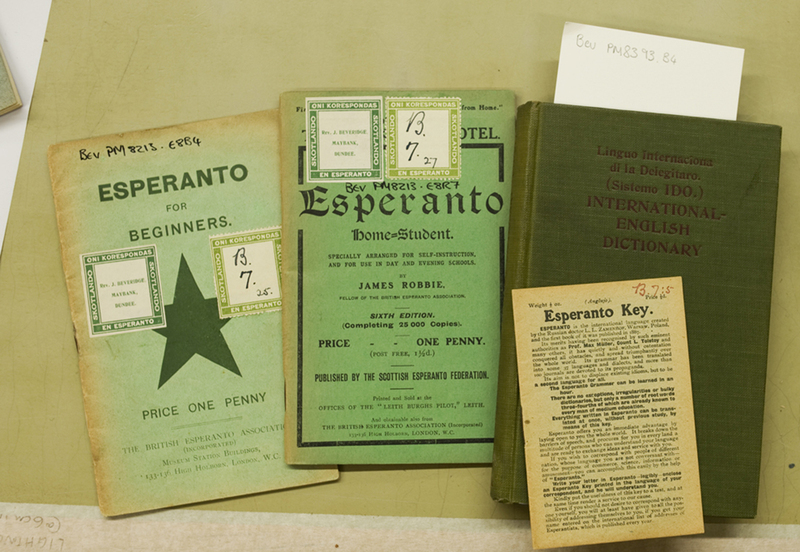 A portion of the Esperanto collection found within the library of the Rev. John Beveridge. For this week’s how-to post, I’ve taken some inspiration from one of our quirkiest collections, that of the Reverend John Beveridge (1857-1943). 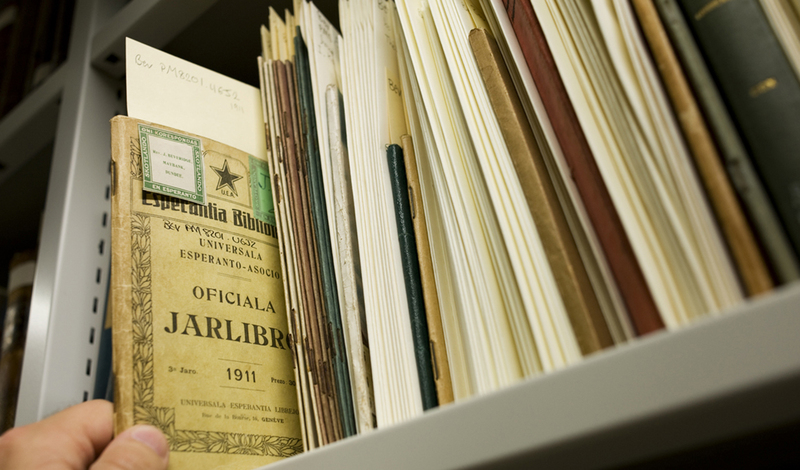 Beveridge gifted his library and archive to the University in 1943, the year of his death; the book collection of over 1,700 items almost exclusively reflects his three main interests Norway, beekeeping and Esperanto. I’m afraid the blog-budget couldn’t support a personal fjord-cruise for this blogger, nor do I have any desire to be stung a hundred times in a vain attempt to keep bees; therefore I’m turning my mind to learning a bit of Esperanto and translating some historic verse from our collections! Dr L.L. Zamenhof’s Fundamenta krestomatio de la lingvo Esperanto (1903); and the Rev. John Beveridge with a soon-to-be-married friend in traditional Norwegian costume. Beveridge was ordained into the United Presbyterian Church in 1882 and ministered in Stow (Midlothian), Wolverhampton, Dundee, Fossoway (Kinross-shire), and Gartmore (Perthshire) before retiring from the regular ministry in 1926. During this time Beveridge became involved in the developing Esperanto movement, which ultimately culminated in his participation of the translation of the New Testament into Esperanto, published in 1912. Beveridge’s work for the Esperanto translation of the Bible is outlined in his correspondence with J. Cyprian Rust, W.M. Page, editor of the “British Esperantist“, J.M. Warden, chief editor of the Esperanto translation of the Bible, and Dr L.L. 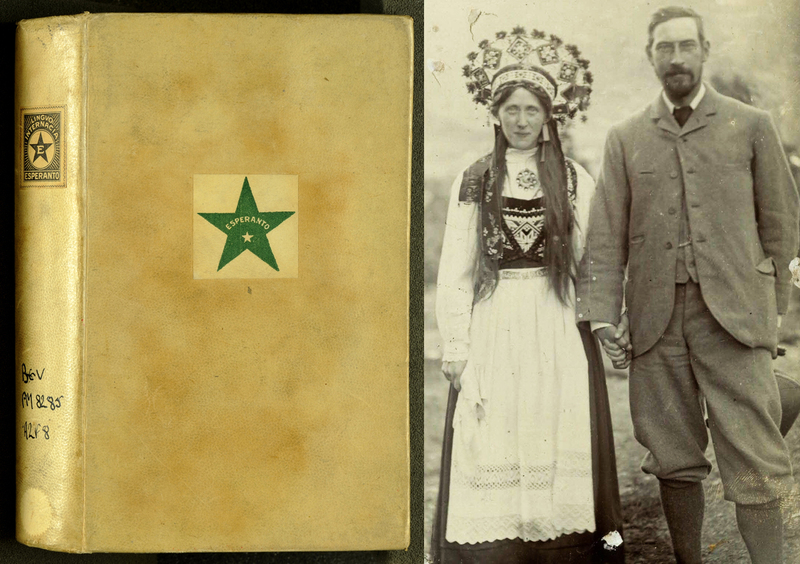 Zamenhof, the originator of Esperanto. The correspondence also includes articles on and guidance rules for Bible translators, a few translations of short stories (some delivered as lectures), programmes for Esperanto congresses in Dundee (1911), Glasgow (1919) and Rothesay (1935), and orders of service, prayers and a sermon (all in Esperanto) for an Esperanto service held in Dunfermline Abbey in 1937. Some tools to get me started in Esperanto: (from left to right) Esperanto for beginners, The Esperanto home-student, Esperanto key and Linguo internaciona di Delegitaro (International English Dictionary). Seeing as Beveridge was a keen translator of works in Latin and Greek into Esperanto, I thought I’d try my hand at doing something similar. 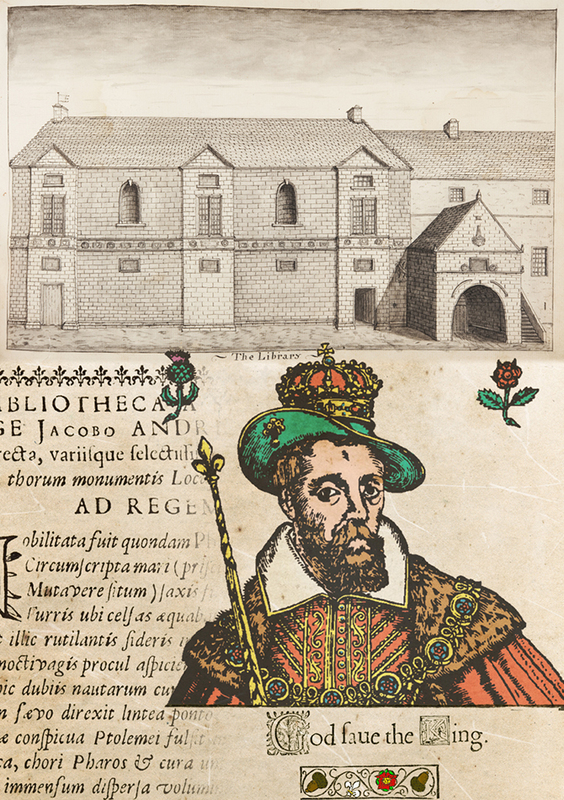 I worked on a translation of a Latin poem into modern English for an exhibition two years ago on the founding of the King James Library; a poem which celebrates the foundation of the University Library by James VI & I. 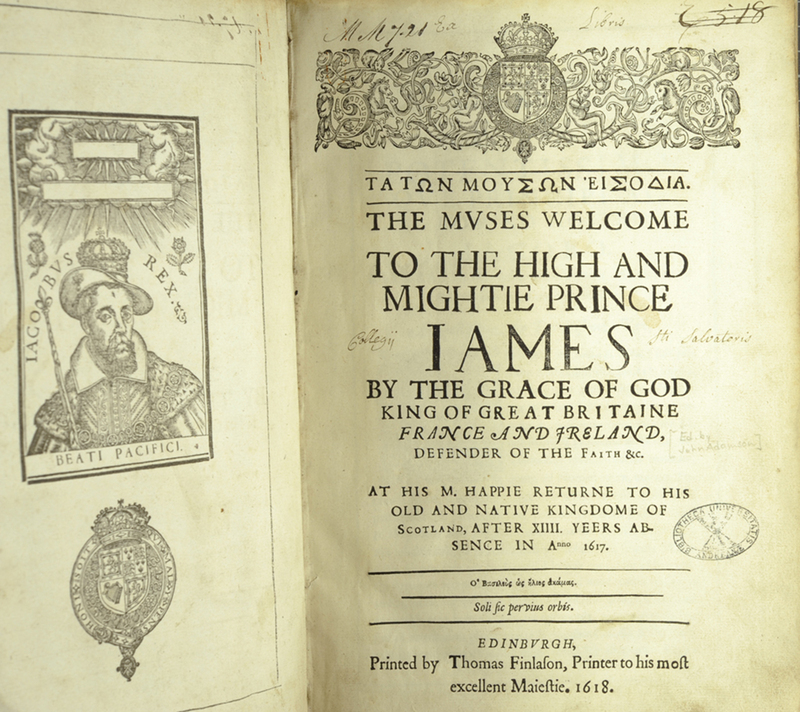 It was written by Andrew Bruce in 1612 and read to King James by Peter Bruce, Rector of the University, on 11 July 1617 when the King visited St Andrews and officially opened the Library. This address was delivered on the porch of Holy Trinity Church on South Street, just across the street from the site of the new library building. 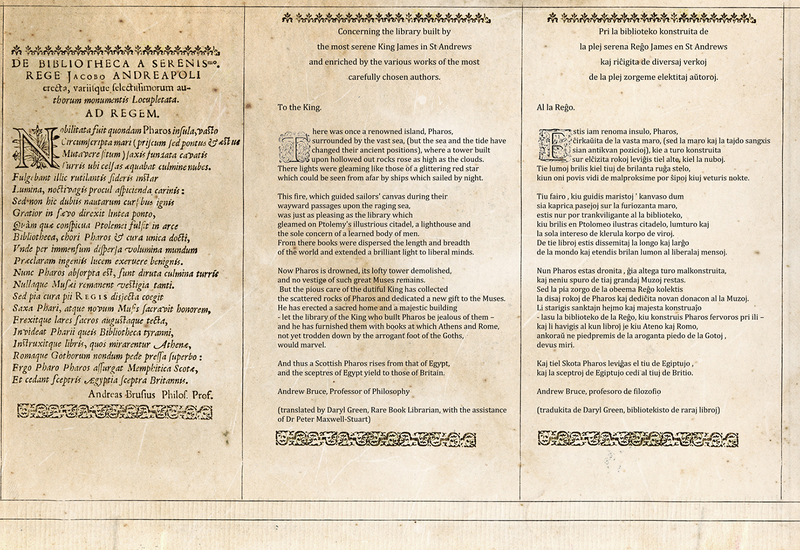 This poem was printed in The muses welcome to the high and mightie Prince Iames by the grace of God King of Britaine , France and Ireland, Defender of the Faith, &c. at his M. happie returne to his old and native kingdom of Scotland…(1618), a kind of itinerary of all of the official visits that James VI & I made during his one and only return to Scotland as King of Great Britain. 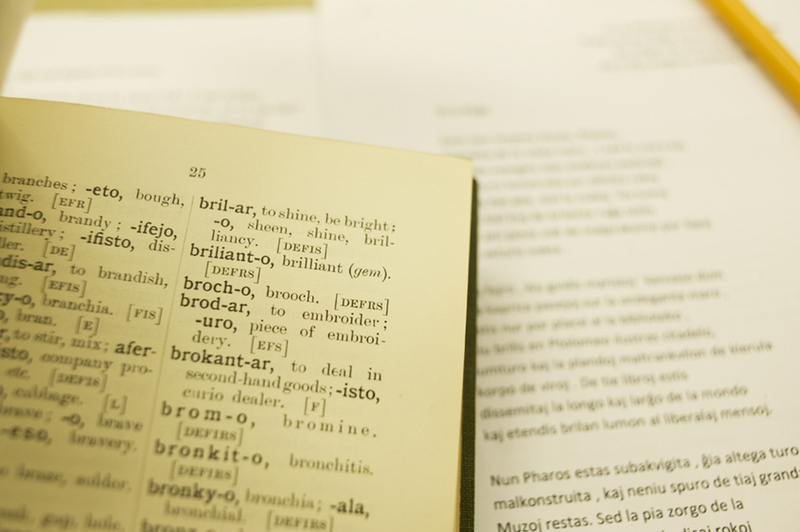 Using Rhodes’s English-Esperanto Dictionary (1908) for final translation work. I figured since I already had some experience with this poem and its aloof imagery that translating it into Esperanto would be fitting. The short poem equates King James’s gift to St Andrews as the re-founding of the Pharos of Alexandria, the lighthouse which guided sailors to Alexandria and its great library. Bruce describes King James’s efforts as “collecting the scattered rocks of Pharos … constructing a new sacred home and majestic building”. So, off the to grammars and dictionaries I went. Esperanto is pretty easy to key your mind into, and for a native English speaker with pretty solid Latin proficiencies, the structure and vocabulary weren’t too difficult. The vocabulary is kind of half-Latinate and half-not, and especially nouns were quick to handle: insula->island->insulo; nubes->clouds->nuboj; etc. Esperanto’s structure is built to be spoken, and is very familiar to an English/German speaker, (noun, verb, object, etc. ), with the added bonus of only two cases for nouns (nominative and accusative) and three verb tenses. Only a single definite article, easy conjunctions, and very easy plural noun structures put this blogger in translating heaven. The most difficult parts of this translation were working out the complex Latin/English moods, and then the final choice of vocabulary. A translation, by this humble blogger, of a Latin dedication to James VI & I by Professor Andrew Bruce (c. 1617) from the original Latin into English and from the English into Esperanto. 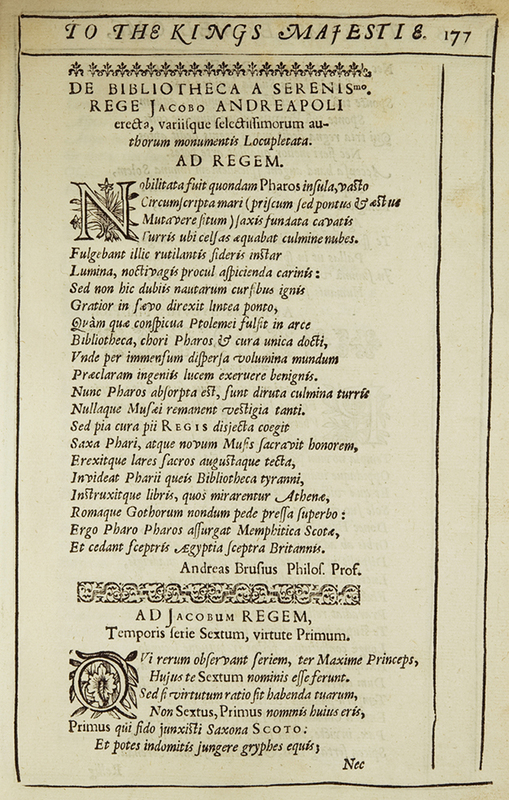 The original Latin poem, by Andrew Bruce, from The Muses Welcome. de la plej zorgeme elektitaj aŭtoroj. sur elĉizita rokoj leviĝis tiel alte, kiel la nuboj. kiun oni povis vidi de malproksime por ŝipoj kiuj veturis nokte. la sola intereso de klerula korpo de viroj. de la mondo kaj etendis brilan lumon al liberalaj mensoj. kaj neniu spuro de tiaj grandaj Muzoj restas. la disaj rokoj de Pharos kaj dediĉita novan donacon al la Muzoj. kaj la sceptroj de Egiptujo cedi al tiuj de Britio. I’d be interested to see how Bill Chapman’s list of corrigenda in the Esperanto compares with my own. I hope to visit Scotland in July or August 2015, either just before or just after attending the international hymnological conference in Cambridge and the 100th World Congress of Esperanto in Lille, and I would be thrilled to pieces if it were possible to see the Beveridge collection. As a hymnologist and an Esperantist, I am particularly interested in the materials pertaining to the 1937 service at Dunfermline Abbey, as well as anything in the way of hymn texts (original or translated) that he may have written or collected. The only hymn I know of that is to his credit is the standard Esperanto version of “Veni Emmanuel”, “Ho venu vi, Emanuel” (http://www.oocities.org/cigneto/thctxt/h/hovenuvie1.html), sadly lacking in the acrostic department (and lacking two of the seven requisite stanzas for monastic use) but quite singable and frequently reprinted and sung. I was interested to learn that he was a Presbyterian; the Esperanto version of the NT is normally described as an Anglican project. (The OT as published is based on redacted versions of Dr. Zamenhof’s translations. The Apocrypha, which didn’t come out till around the turn of the millennium, is primarily the work of Dutch Free Churchman Gerrit Berveling. Just FYI 😉 ) Incidentally, do you know what Rev. Beveridge’s first initial, B., stood for? He is normally cited in the Esperanto sources as “B. John Beveridge” but I have never seen an explanation of the B. RSVP! Hello! I actually am not sure about what the “B.” would stand for, and I don’t have any references here in our archives, I’m afraid! As for your visit next year, you are most welcome to visit our reading room and explore the Beveridge collection and archive, just let us know when you’re coming in advance! I’l let you know if I’m going to be able to visit. Probably won’t know for sure till next spring. What are the days and hours it could be accessed? Our reading room is open Monday-Friday, 9:30-16:30!